WSDOT’s Bridge Preservation Program combines cost effective actions and strategies to maximize the useful life of bridges. This work includes bridge seismic retrofit, repairs and rehabilitation, steel bridge painting, concrete deck rehabilitation, scour mitigation and bridge replacement. The Seismic Retrofit program works to minimize and avoid catastrophic bridge failures by strengthening bridges and structures to better withstand earthquakes. Bridge engineers inspect bridge elements above the foundations and then compare the capacity of those elements to the forces applied by an earthquake (the demand placed on the structure). Columns (as shown above) are being wrapped with a steel jacket to contain and stabilize the concrete column which prevents cracking and possible failure during an earthquake. 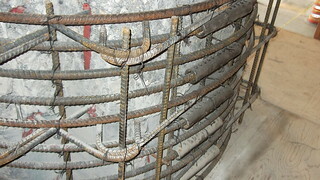 The most common type of retrofit adds steel jackets around the columns and additional concrete-and-steel reinforcing to the pier caps (also known as a “bolster”). More than 900 bridges are part of the Bridge Seismic Retrofit Program. Retrofit priorities are based on seismic risk of a site, structural detail deficiencies and route importance. We strengthen structures around the state based on what is most vulenerable to earthquakes. This is done either through installing steel jackets on columns, adding more structural supports or as an alternative method, using rebar wrapped with steel. Our largest structures, then any bridges without backup stability and finally anything that is an essential route to withstand the horizantal movement of earthquakes. steel (as seen above) to withstand vertical forces caused by the ground motion. WSDOT worked with the State Department of Emergency Management, local emergency planners and freight advocates to identify a network of essential state highways in the areas of Puget Sound with the largest predicted ground motion and the highest density of population. Focusing limited resources on these routes further reduces the risk of major damage. This network of state highways is identified as the Seismic Lifeline Routes. The Seismic Lifeline program tracks the status of seismic retrofits made to high and moderate-risk bridges in the Puget Sound area which has the highest risk of acceleration (See the Seismic Lifeline Routes Map on the back). Further prioritization will occur as the bridges on this network are retrofitted. would prevent the concrete from crumbling. Scour is the removal of soil from around bridge piers and abutments. Flowing water transports soils from around bridge piers and abutments and moves it down stream, leaving the bridge foundations exposed and in some cases undermined. Undermined bridge foundations can compromise the integrity of the structure and in some cases cause collapse. Scour is the leading cause of bridge failures in Washington state and nationwide. Of the 70 documented bridge failures in Washington state history, 43 were due to scour. We have approximately 1,583 vehicular bridges and culverts over 20-feet in length that span over water. 262 of these bridges are considered “scour critical” which means there is potential for the bridge to be damaged by scour. WSDOT’s efforts to ensure that these bridges are safe and haven’t been damage by scour fall in to two categories, monitoring and response. We perform routine inspections of its bridges at least once every two years. In some cases where there are specific concerns, bridge inspections are more frequent. 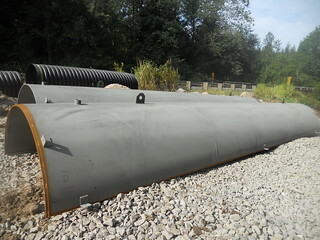 During these inspections, the bridge inspectors observe conditions at the bridge piers and abutments as well as the waterway upstream and downstream of the bridge. Bridge scour conditions are recorded in the bridge inspection report. If significant scour is observed, the bridge inspector will call for a repair. Where conditions are difficult to evaluate due to water depth or other conditions, the WSDOT Dive Team will perform an underwater inspection of bridge elements. Divers performing the underwater inspection are able to gather detailed information about scour conditions. Once again, if significant scour is observed, the bridge inspector will call for a repair. Our scour critical bridges are monitored by WSDOT staff during flood events. The monitoring is conducted in accordance with a “Scour Plan of Action”, which is a documented plan that has been prepared ahead of time. The plan of action includes a summary of the scour vulnerabilities and guidance for actions to be taken during flood events. Actions include monitoring bridges during and after flood events as well as closing bridges if conditions exceed a pre-determined threshold or if scour damage is suspected. If scour damage has occurred that compromises the integrity of a bridge, the bridge is closed to traffic until repairs are made. If scour has occurred but the damage does not compromise the integrity of the bridge, WSDOT will take action to repair the damage. Some repairs are completed by WSDOT Maintenance crews while others are completed under contract. Who completes the repair depends on several factors including what part of the State the bridge is located in, the nature of the repair, and the anticipated cost of the repair. How were Bridge Scour Mitigation Measures completed in the past and how is it done today? In years past, the majority of bridge scour repairs were completed by WSDOT maintenance crews. Repairs were completed quickly and efficiently at a relatively low cost. 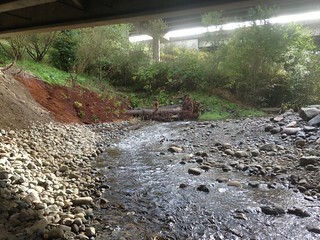 WSDOT maintenance crews were able to install and maintain scour countermeasures that significantly reduced the risk of scour damage to our bridge. Today, the efforts required to obtain permits for bridge scour repairs preclude WSDOT maintenance crews from completing bridge scour repairs in many parts of the State. WSDOT maintenance crews in these areas don’t have the staff or funding that would be required to obtain the necessary permits. 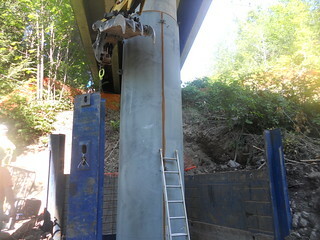 So, most bridge scour repair projects are completed through the Bridge Scour Mitigation Program. The WSDOT Bridge Scour Mitigation Program addresses only the worst bridge scour deficiencies by designing, permitting, and constructing bridge scour repairs under contract. Identify Needs – Bridge inspection data is reviewed to identify bridges that have a bridge scour repair need. Prioritize Needs – Once the list of needs is determined, the details of each case are reviewed and prioritized against each other on a statewide basis. Program and Fund Projects – The funds that are available for bridge scour repairs are assigned to the top bridge scour needs. Usually only three or four bridge scour repair projects are programmed each biennium. Design Repair – Our staff, including bridge engineers, hydraulic engineers, and environmental staff work together to design the repair and appropriate mitigation. Obtain Permits – Our staff works to obtain permits from the appropriate entities to construct the repair. This process usually takes about two years. Construction – The project is advertised and awarded to the Contractor with the lowest bid. Construction of most scour repairs typically takes less than a month. Bridge scour is dynamic and conditions can change rapidly. There are many variables that affect the rate at which bridge scour happens. Two of the primary variables are soil type and water velocity. Some soils are more susceptible to scour than others. Loose unconsolidated soil is easily carried away while hard bedrock layers are generally not susceptible to scour. Also, high flow velocities scour away soils faster than lower velocities. A major cause of higher velocities near bridge piers is due to the accumulation of wood debris that floats down the river and gets hung up on the bridge. This wood debris can constrict the channel and cause localized areas of high velocity flow that scours away supporting soils. Meeting the requirements of each entity is often very challenging, time consuming, and often results in added costs in construction, due to added constraints and required mitigation. Because the process to complete scour repairs is expensive and lengthy (two year minimum), we can only address a few scour repairs each biennium. This means we can only react to only the worst needs through emergency scour repair projects.